YBG in parliament. Photo by Omar Anas of al-Ahram Weekly. 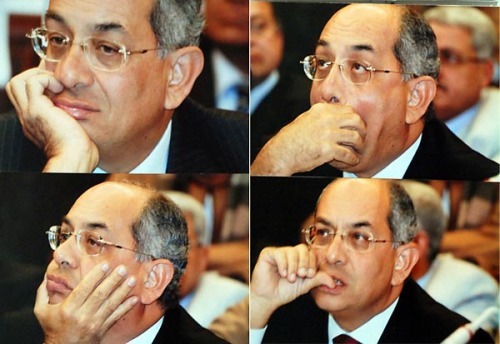 Abdel Fattah Omar, parliament's national security undersecretary, launched a withering attack on Finance Minister Youssef Boutros-Ghali in Tuesday's parliamentary session over the latter's controversial economic policies. "The minister doesn't pay attention to anyone and is hated by both the government and the people alike," said Omar. "I wouldn't be surprised if he ends up assassinated like his grandfather." Boutros-Ghali's grandfather served as Egyptian prime minister from 1908 to 1910. He was assassinated in 1910 following accusations of entertaining sympathies for Egypt's British colonial occupiers. Omar went on to urge the Interior Ministry to lead the government so as to "restore order," both among government ministries and on the street. "Because certain ministers have taken wrong decisions, the Interior Ministry has had to deal with street demonstrations," he said, calling on Prime Minister Ahmed Nazif to punish those ministers found responsible for popular protests. Quite apart from being tasteless, this is yet more anecdotal evidence of the transformation that has taken place in the past decade in how the Interior Ministry's role is perceived. Due to the social instability of the country and the rise of protest movements from Kifaya to blue collar workers, the Interior Ministry is increasingly seen as a legitimate policy driver, since it has to clean up the mess. In several labor demonstrations we've seen the Prime Minister and other similar officials come away empty-handed from negotiations, while when a police general is sent in the matter is resolved quickly. In other words, there is a shadow government that handles many of the day-to-day issues that politicians and ministers should be dealing with. The Interior Ministry and State Security in particular has become an inextricable part of the way the business of government is conducted, acting as the middle man between the policy planners — the cabinet and the Policy Committee of the ruling party — and citizens. It's not surprising that this MP wants to see the technocrats like YBG take a backseat to the securocrats like Minister of Interior Habib al-Adly: it's already the way things are being done informally. I touched on this "securitization" of governance in a recent article for MEI (subs).